Categorized as: Caribbean, Education, Grantee, Latin America, Our Partners, Stories, Youth & Tagged as: Community based organization, Corporal punishment, Critical thinking, Dimagi, Gates Foundation, Haiti, Leadership, Nedgine Paul Deroly, Obama Foundation, Paul VanDeCarr, Slavery, Stealth grantmaking, Working Narratives on September 22, 2018. Anseye Pou Ayiti’s teachers believe they can unleash leadership and prosperity for their country through quality education for all. Editor’s Note: Anseye Pou Ayiti (or APA, Kreyòl for Teach for Haiti) is a nonprofit organization that recruits and equips local teachers in rural primary schools to elevate students’ learning, transform classrooms and communities, and build a Haitian-led movement of civic leaders to spread educational equity. APA has been our partner soon after their founding in 2014, after a four-year process of listening to teachers, students, and families share what’s needed in the nation’s education system. 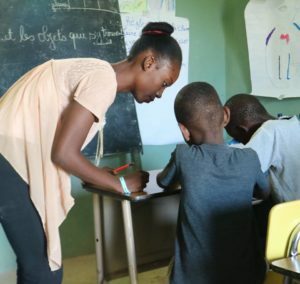 Because they began with deep listening and baseline metrics, they leapfrogged over much trial-and-error and needed only further financial support to expand to more Haitian schools. For us, that was a no-brainer. We discovered them in 2015, thanks to our stellar human network—in this case, Paul VanDeCarr, storyteller extraordinaire who became part of the Skees family through our past partnership with his nonprofit organization, Working Narratives. In what’s become our typical “stealth grantmaking” style, we researched APA and elected to support them before offering our multi-year, paperless, unrestricted “Seed” grant. When that Seed grant had finished, APA had measured base points and impact metrics, adapted programs to fit community requests, reached student-passing-rates several times higher than national norms, and formed partnerships in new communities. 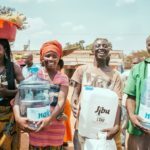 This was an obvious case of a social enterprise ready to scale, and we awarded APA with our largest “Catalyst” grant. Yet we’d supported them from afar for four years, relying on video calls and emails to observe and applaud their work. We niggle over every dollar of our budget and pride ourselves in keeping expenses low by working from home—thus, global site visits had remained beyond the reach of most of our volunteer board members, all of whom work hard in primary jobs to support our families. Then this year, along came a rare opportunity—the JasmineHugh Heart Fund, a matching-grant program (privately funded so as not to detract from our grants) that allows board members to raise a portion of the cost to travel with our families to visit partners face-to-face. That enabled two board members—Sally and me—along with our families, to visit APA in July. Spending time with them convinced us of the validity of what we’d observed across the miles in our virtual relationship with their team. They were, in fact, even more passionate, dedicated, and delightful than we’d expected. Skees Foundation members with APA Co-Founder and CEO, Nedgine Paul Deroly (2nd from R). Transform education indicators so that enrolling in primary school without completion is no longer the norm for children in underserved schools. Improve student outcomes so 100% of students pass the national exams and pursue secondary education. 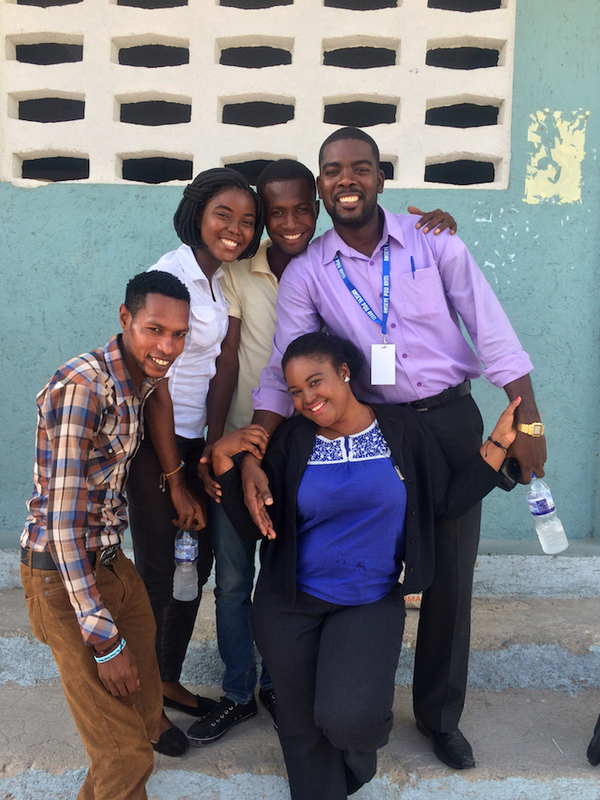 Invest in top Haitian talent for the long haul, so their alumni ambassadors remain in Haiti and fill a critical gap in local capacity. APA alumni ambassadors will be career teachers driving groundbreaking student success, school leaders, instructional coaches, policy makers, and members of Haitian philanthropy and business sectors who continually promote equal educational opportunity for all Haitian children. 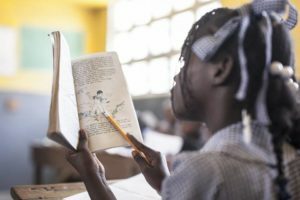 According to their theory of change, improving the quality of education and rates of matriculation for Haitian students will increase job-readiness, leadership efficacy, and skills of Haiti’s workforce, resulting in higher outputs and GDP. And that’s how we experience the country: As we absorb the somber history of slavery in the National Museum and generations of natural disasters, political corruption and mismanagement, racial oppression and systemic poverty, we feel alternate waves of guilt (as Americans, who’ve done Haiti no favors) and rage (as global kin, acutely aware of how unjust is its plight) . . . But as the our weeklong visit progresses, something else takes over: admiration. We share meals, conversations, World Cup games, and an authentic vodou religious ceremony . . .
And the more we get to know Haiti, the more we see Africa. It’s the family values and unbreakable resilience, the innate kindness and pervasive spirituality. And it’s more than DNA, which links 95 percent of Haitians to Africa. Despite being trafficked as slaves, abused and assaulted, and then shunned by the global community upon achieving national independence in 1804, Haitians retain an unshakable strength, hope, and joy that only makes sense if one knows their motherland, Africa. Haitians are also unapologetic about the pride in their African roots. And with Haiti just seven hundred miles off the coast, we could say it’s our Africa, next door. APA works to repair the frayed social fabric of Haiti and create pride through deep community engagement—including parent associations, teacher-leader and student-leader celebrations, and a peer-learning program for APA alumni to spread the movement across the nation. Read our coverage of their work here and here. “Depth is scale,” claims APA. That means the deeper they go into each classroom and community, the broader and more sustainable the impact will be. Using technology to track progress, APA partnered with Dimagi, Inc. in 2015 to create and deploy a customized mobile application that gathers data every two weeks which assists with coaching and monitoring progress of teacher-leaders and students. There is now international interest in this powerful tool, with APA selected to present the learnings from their mobile app during an upcoming mobile education symposium in Washington, D.C.
As a result of this belief, APA deliberately chooses to work with existing schools. Also, to create an easily replicable model for quality education enables regions across the nation to see the possibility of adopting new practices and maximizing human resources they already have. This approach of bringing out the talent and leadership inherent in educators and students reflects a larger vision, an asset-based approach to social change. APA gambled that those already in the school system would blossom if given resources and confidence; and they were right. APA holds community forums, like a recent one to which three hundred people came to talk about the tradition of corporal punishment—illegal but still the norm. “We asked the community, where did this tradition come from?” recalls Nedgine. “Not from Haitian or African culture; rather, from imperialism and colonial traditions imposed upon the education system. When teachers see it this way, they’re open to change. Class President Navély rehearses his graduation speech for with APA Co-Founder and CEO Nedgine Paul Deroly at his school in Gonaïves, Haiti. We meet Navély, the class president. His mom, who travels back and forth from the Dominican Republic for work, remarks that he used to be “rambunctious.” Now, he holds himself with calm assurance and practices for us a part of the speech he will deliver at the graduation ceremony this weekend. A key component of APA’s teaching approach is their annual visioning exercise. 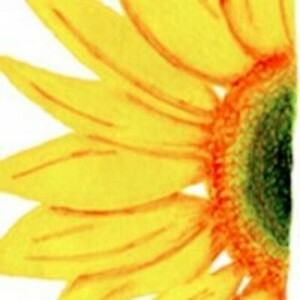 Starting as young as kindergarten, all students respond to prompts to discover their vision of themselves at age twenty-five. Many are so inspired by this exercise, they have taken a new name for themselves, e.g., “Agronomist Naichka” or “Engineer Jonathan.” Then they plot out a course of action to garner the skills needed for their career, and their teacher-leader guides their learning. The process begins with a question: “What will fulfill you?” and the exercise builds a foundation of pragmatic means toward that end. Sarah talks about what American schools can learn from APA’s Haitian curriculum. The two young women from our family, third-generation Skees Foundation members, are very impressed with the visioning exercise. 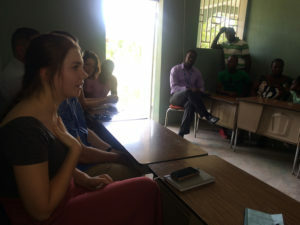 Twenty-year-old Michaela, a junior at the University of Vermont (UVM), says she could learn from these students, as there is nothing like this at colleges in the U.S. Sixteen-year-old Sarah, a high-school junior in upstate New York, says the U.S. places emphasis on taking exams and getting high grades rather than knowing what you want to do (in your career) and what it takes to get there. They both feel that American students could greatly benefit from APA’s visioning model. 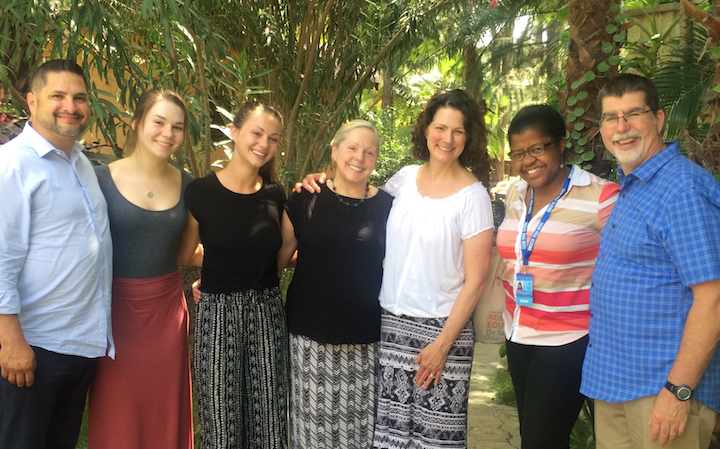 (L to R) Student leaders and their teacher talk with SFF director Sally Skees-Helly. “Since Esther has been coached with APA,” Miriam continues, “she has a 100 percent pass rate in her classroom. One Friday per month, our school organizes peer coaching sessions so the APA teacher-leader can share what she’s learned with the rest of the faculty. 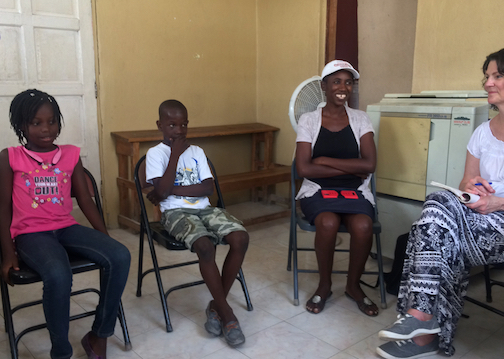 Even during recess, kids used to fight with each other, and now they do not.” She wishes APA could reach all ten geographic departments of Haiti. Esther reflects on how her teaching style has changed. 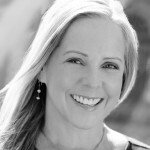 “I used to teach just to teach [facts]; but with APA it’s not only about following the curriculum, but also to follow the evolution of the students.” She now encourages students to participate in dialogues and discovery. The Gates Foundation, which just announced a new round of $92 million in education grants within the U.S., has shifted their strategy toward replicating APA’s model—perhaps without even knowing it. According to Howard Blume, writing for the Los Angeles Times, “Experience seems to have taught them not to impose so much from outside. They want to create networks of schools that will work together, with help from experts, to solve problems—and then share strategies and research.” Maybe they can go back to school just like we did, and learn from APA how to catalyze quality education from the ground up. A panel discussion of APA teacher-leaders mulls over the topic of change—both internal in them and external in their country. Their teaching styles have shifted away from rote memorization and toward engaging students in critical thinking and inquiry, as well as how to work in groups. Transformational leadership, they tell us, begins with changing your own mindset. “Many of us were not leaders before we entered the APA fellowship. Before, we had a complete lack of hope and despair about Haiti. Now, we believe we can choose to change,” says Emmano Medina. She cites perseverance, nurturing, and dedication as natural results of APA’s training. Take a virtual visit to Anseye Pou Ayiti here. Or, dance with teachers and students in this celebratory video of APA in action this year. Photographs and video courtesy of Anseye Pou Ayiti. 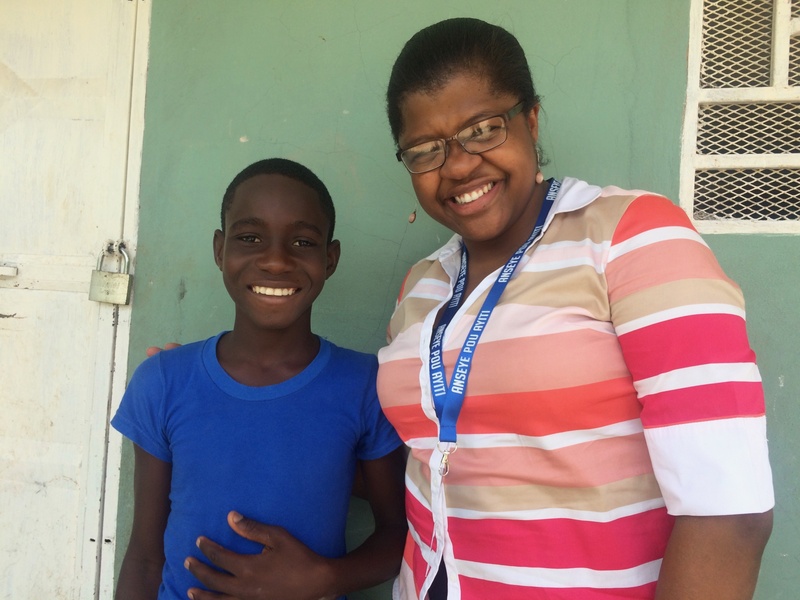 LEARN more about Anseye Pou Ayiti here. 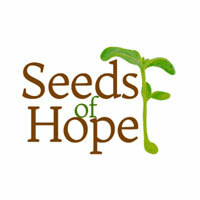 DONATE directly to Anseye Pou Ayiti here.